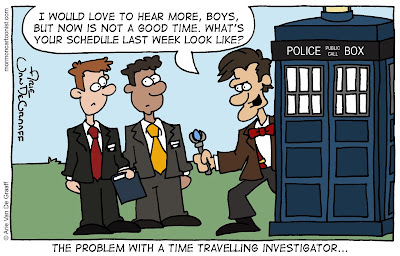 We here at the Mormon Cartoonist household can hardly wait for Saturday's big Doctor Who 50th Anniversary Special. I was first introduced to the Doctor years ago through a combination of my big brother, PBS, and that one guy with the long, long scarf. In those dark days Doctor Who was the only show available that catered to the sci fi, nerd demographic so I put up with it despite it's ridiculous special effects and story lines that played out at the pace of a soap opera. And then Star Trek: The Next Generation premiered and I no longer had to settle for Doctor Who. Soon, the BBC cancelled Doctor Who, but at that point I'd stopped paying attention. Meanwhile, here in the States, we had Deep Space Nine, X-Files, Lost, and a host of other shows to satisfy our nerd passion. But at some point, sci fi became less about gathering the whole family together to watch something and more and more adult (contrast the original Battlestar Galactica with the hugely popular remake). This is where Doctor Who returns. When the BBC brought back Doctor Who in 2005, it filled the family-friendly niche in television sci fi that had been missing since the end of Star Trek: Voyager. Best of all, though, Doctor Who is awesome. It's funny, scary, exciting. It is all things at once. The premise is brilliant: the smartest guy in the room travels anywhere and anytime in his time machine to right wrongs. Check it out--it's worth your time. I just about remember the very first episode... and still watch whenever the Doctor is on. My daughter's got the bug too (I told you about the Doctor Who roleplaying game at a Young Women's meeting!) 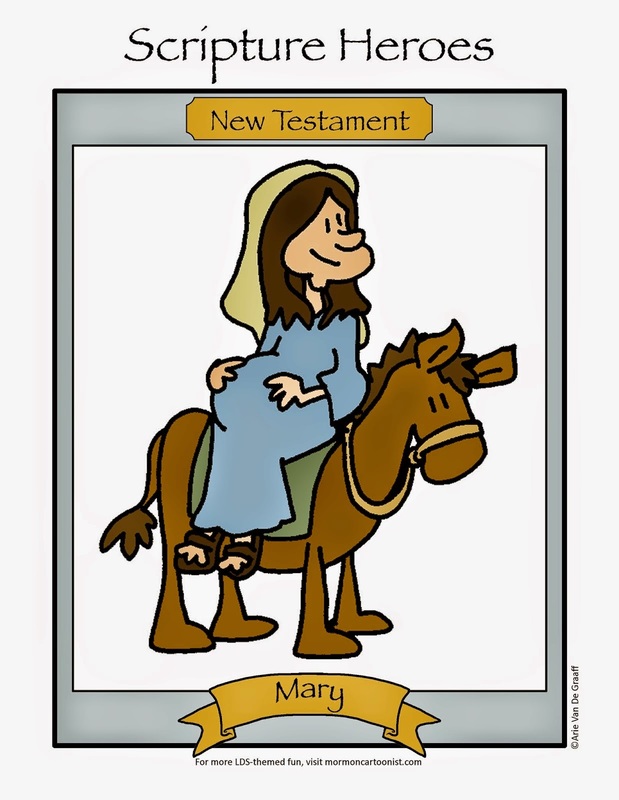 and last Sunday her Sunday School teacher said "She made a few comments in class that weren't about Doctor Who!" 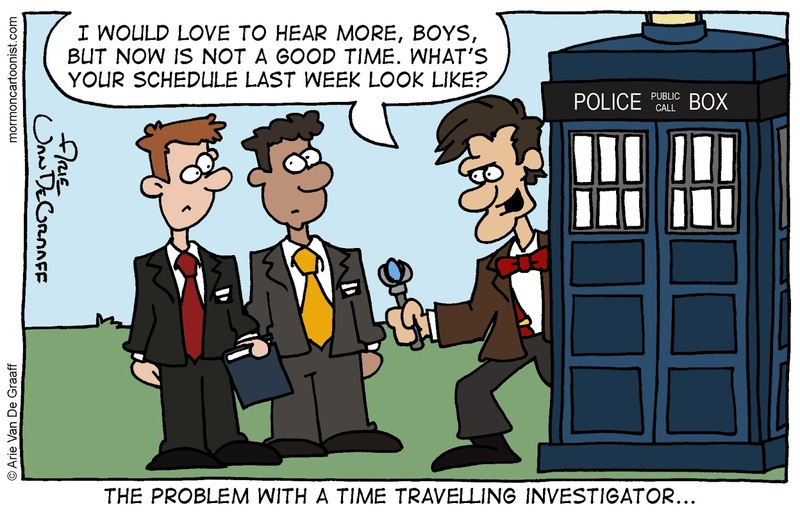 There are just enough regular readers of this blog (Kevin and Megan particularly) that are confessed Doctor Who fans that convinced me to run this week's gag despite the amount of readers who would be left scratching their heads.